ABBEY DREAM MEANING AND INTERPRETATION. Have you ever dreamed about being in an Abbey – please leave your dream or comments below. A spiritual aspect to your life is about to unfold. Buildings in dreams usually represent the dreamer, the body or the various levels of the mind. The Abbey is a holy place, ancient and free of pomp. It symbolises the true you- your spiritual self. If the Abbey is very old then you may be prompted to explore the wisdom given to us from ancient times such as the stories of the Celt or the early Christian myths. These dream-like tales will help to trigger your spiritual awakening and draw upon the archaic powers of the unconscious. Mystical Meaning: Although generally considered a good omen superstition says that if a young woman dreams of entering an abbey it foretells an illness. A ruined abbey predicts that plans will fail and if your way to the abbey is blocked it augers that you will be saved from a ruinous mistake. To dream of an abbot also means an illness or plot is afoot but an abbess denotes happy friendships. 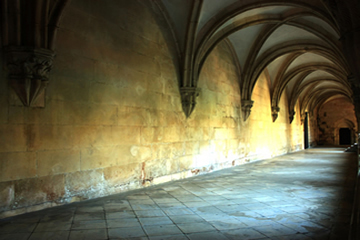 Dreams about an Abbey may have a spiritual significance. Only dreams that are on this topic of abbeys will be included. If you have a dream with another theme please first consult and post on our on-line dream dictionary.